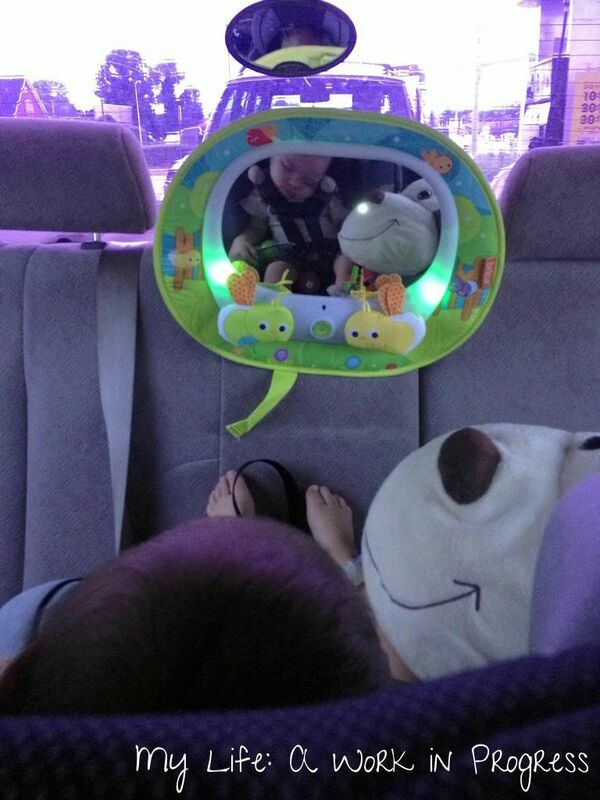 Brica sent me their Baby In-Sight Magical Firefly Auto Mirror to review. The Baby In-Sight Magical Firefly Auto Mirror by Brica lets you choose from two modes: entertaining or soothing. Each mode has up to 24 minutes of music (eight songs) available and features choreographed lights. In the entertaining mode, LED lights slowly flash in shapes and patterns along with the music. The lights fade on and off in the soothing mode. The included remote lets the driver control music, lights, and volume from the front seat. To conserve battery life, the mirror has an auto shutoff. The mirror is crash-tested and proven to be shatter-resistant, providing superior reflection and a distortion free image. First, I want to mention that Brica sent me a handwritten, personalized note, and they actually spelled my name correctly. Trust me, that rarely happens. It really impressed me, because it means someone at the company cares about their products and, in turn, the bloggers they’re working with. That alone is enough to make me pick this brand over another when I’m purchasing baby and kid items. I wish I’d known about this mirror when Baby J was a newborn. For the first three to four months, he screamed every time he was in the car. We had a plain Brica (affiliate link>) mirror that stuck onto the back windshield. It worked just fine to see him and still does…but there was nothing on that mirror to entertain him. The reason I didn’t buy a mirror like this Baby In-Sight Magical Firefly Auto Mirror is that I didn’t think it would work since we don’t have a headrest behind the middle back seat. Baby J is in the safest spot for a single child his size, rear-facing in the middle back seat. 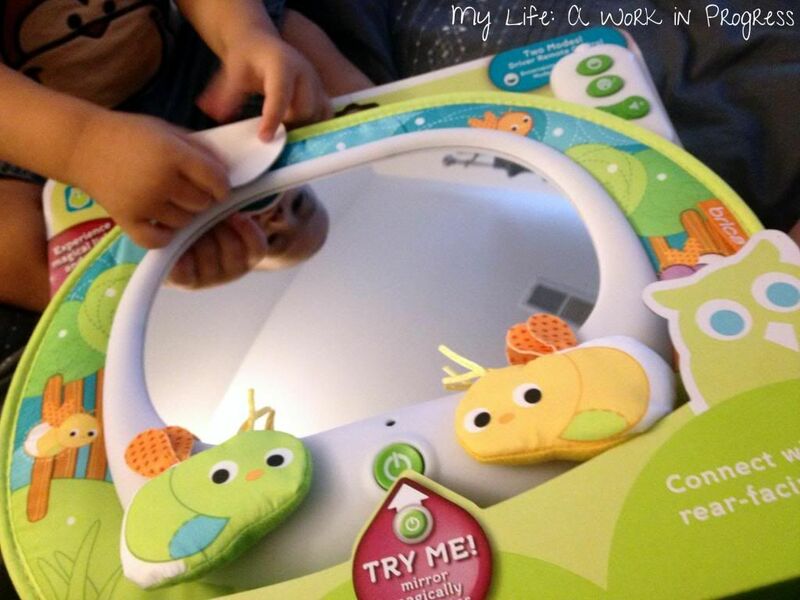 I was surprised and excited to discover the Baby In-Sight Magical Firefly Auto Mirror works for him! I just clip the mirror strap into the top latch system. There are actually a few different ways to secure this mirror for rear-facing and forward-facing children. The music reminds me of elevator music, and it’s a little tinny (you can listen for yourself in the video below). The music doesn’t bother me though. For one, I can turn it down, so I really can’t hear it. Second, I’ve always had the philosophy that I’d rather hear music, squeaks, or any toy sounds than my son’s whining, crying, or flat-out screaming. At 14 months, he’s extremely entertained by this mirror. We’ve had the mirror for about 3 weeks, and Baby J laughs and makes faces at himself every time he’s in the car, unless he’s sleepy. If he’s sleepy, the flashing lights of both the entertaining and soothing mode knock him out. If I look back there when the car’s stopped, I can see him just staring blankly into the mirror as his eyes begin to close. I can see my son really well. The reflection is quite clear, and I can even see what he’s playing with. This mirror is great! Currently, the remote doesn’t come with a battery. You must purchase a lithium battery separately. Brica sent me one with the mirror and remote, and they also let me know that a plan is in the works to start including the battery with the remote, so that shouldn’t be an issue for anyone down the road. The mirror takes three AA batteries, which are included for “try me” purposes. You have to hit the button on the mirror itself to turn it on. Then you can operate it from the front seat using the remote, which attaches to the sun visor. The first week we had it, I had to remember to hit the button when I put Baby J in the car. The last week, he’s started climbing into the car and into his seat by himself, and he pushes the button on the way. All in all, I really like this mirror. It’s cute, entertaining, easy to install, and easy to use. I think it’s a must-add to any baby shower registry! 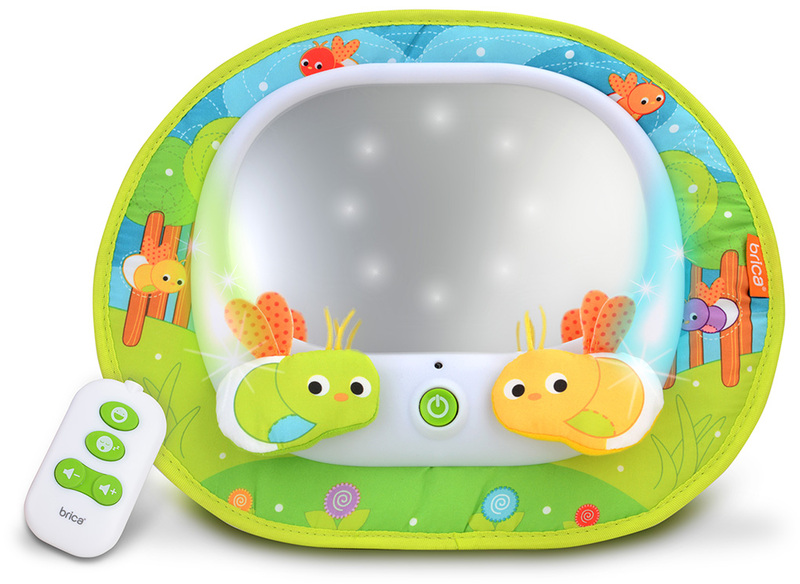 Brica’s Baby In-Sight Magical Firefly Auto Mirror can be purchased for $34.99 at several retailers, including (affiliate link>) Amazon , Target, and BabiesRUS. Visit Brica’s website by clicking HERE. You can even submit product ideas to them on their site, after filling out a Non-Disclosure form to protect your intellectual property. To stay up to date on products and more, follow Brica on Facebook, Twitter, Pinterest, and Instagram. This looks great–I need to check this out for our September baby! The entertaining mode is quite mesmerizing 😉 Very cool product! I wish they had these when my babes were babies. 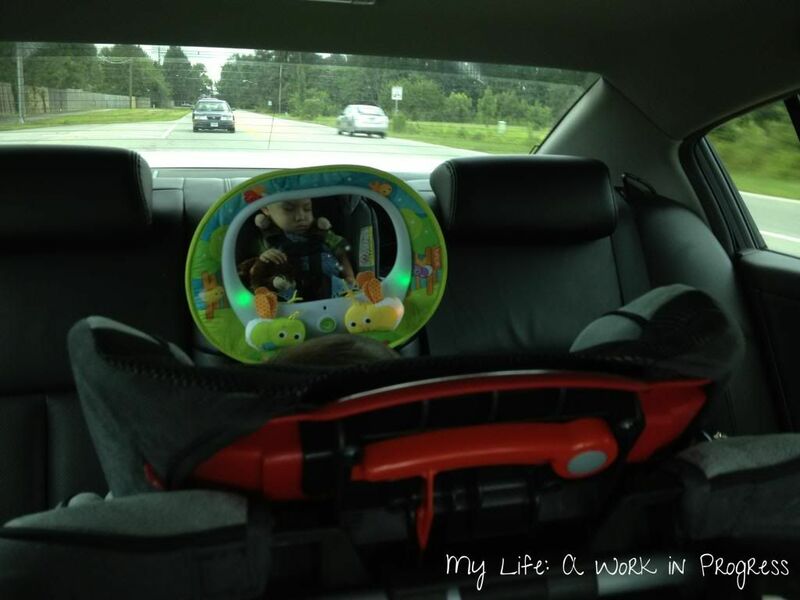 I wish I had known about when I was looking auto mirror for my baby son last Fall. It just looks amazing. Oh that is great! I hate not being able to see my kids! I love this! I am going to have to share this with a friend who is going to be an auntie soon! It is so cute! I love that it is functional AND fun! It’s also really cool that they spelled your name correctly. People ALWAYS spell my name incorrectly! I always wanted one of these for my kids but never got one. The pic of your little one sleeping is just adorable. We had a mirror in the car when our girls were babies, but they weren’t nearly as cool as this one! What a fun idea! I am so like you, it means a lot when people spell my name right. I have friends that have known me for years and still get it wrong! That is just too cute. I’ll definitely be back to try to win one for my friend who is expecting! I could really use this. The one we have right now does not work well. It attaches to the window, but never stays in the right position. Very frustrating! That is really cute, and I know my son would love to look at it while riding in the car! This is really cute and like the mirror really is clear….love that it is musical. I know our new grandson will love this. I would love to have this for my next little one. The one we had for my first son wasn’t the best. Ever since we’ve left the hospital, it has been hard for me to part with her so I end up sitting in the back seat- mostly because I wouldn’t be able to see her and because she usually needs some sort of stimulation when we’re on the road. If I had this, I would be so grateful. My daughter does not like to be in the car, but if she has someone talking to her or showing her a toy she’s happy. This would be awesome, and I’m often alone so I love that it comes with a remote! We love having a mirror to see our rear facing baby. How cute to have it entertain them too. I love the remote that comes with this unit. Easy to access to start the music again when it stops. I wish I had a mirror in the car for our daughter when her car seat was still rear facing. What a good idea! I like that this one also has music and lights. I think that would really help keep baby’s attention. This is really cute! It’s much more interesting than the ones I had for the boys when they were rear facing. Seeing Baby J like it and fall asleep to it… I would so get it for any expecting mama! Hi Misty, I don’t see a remote listed on the Brica site, but I know a lot of companies sell individual replacement parts to different products if you call them. Munchkin acquired Brica a few years ago, but you can call Munchkin customer service here: 800-344-BABY(2229.